When I'm at a breakpoint is there anyway to search my variable pane for an array key or value name? Or for a variable name or value? In any case -- you CAN search by variable name / array key / object field .. but not the value. To search -- just focus that panel and start typing any letters (it searches anywhere in the name, not necessary from beginning of the name). It will not "narrow" the list (will not hide not-matching entries) and it will stop/focus at first possible match. But keep in mind -- it searches in visible / expanded branches only -- it will not find an entry if parent entry is currently collapsed (e.g. from your screenshot -- if you have a key/field in "$this->version['something']" and you searching for "something" it will not find it, as "version" is currently collapsed and therefore sub-entries are not available during such search). You can start typing to search, and it says "search for <your string>" and will find the first kinda-matching thing. It'll fuzzy-find the first occurrence of some part of your search term and give the 1st one that kind-of matches - even if one *exactly* matches later. And there seems to be no "goto next match" that I can find. You have to click the variable under the previous (1st) match - and delete the last search char and add it again to match next - very hacky. There has to be a better search. Am I missing something? Sorry .. it's hard to talk without screenshots (better -- screencast) that would illustrate issue in details (there may be some nuances etc). 5) There is no other search, at least for this tool window. 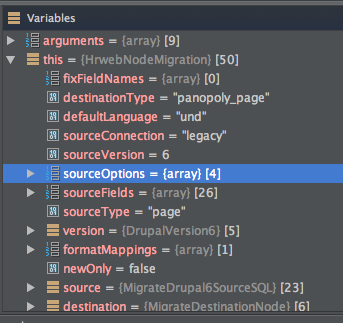 It is very often the case that PHP uses massively nested arrays and so that requires us developers to have to dig deep into them and to have to manually expand them all just so we can search them is impractical. We already have a related request submitted to our tracker here: <https://youtrack.jetbrains.com/issue/WI-22751>. Please vote for it (thumb up button) in order to move it up in the queue and receive notifications regarding the progress of the issue. See more information on working with tracker at <https://intellij-support.jetbrains.com/hc/en-us/articles/207241135-How-to-follow-YouTrack-issues-and-receive-notifications>.